I've been quite the busy gal since I received that awesome box of Disney Side party goodies last January. I traveled to Anaheim for ENMNCon14 then immediately flew to Florida for Princess Half Marathon Weekend. Before I could take note of what zip code I was in, the date for my Disney Side Celebration arrived. I initially had several different ideas, and couldn't wait to start the party planning process. It seemed the only real problem I had was that I'd fallen in love with all of my ideas and couldn't settle on one. So, in early February, I decided I would set-up different themed areas throughout the house to incorporate all of my Disney Sides, and invite our family and closest friends to celebrate with us. As March 1st drew closer, my budget kept shrinking and my work and travel schedules began overlapping. I went back to the drawing board and planned an entirely different party. In stark contrast to the elaborate, Pinterest perfect, expensive, block parties I noticed many of the other selected hostesses had planned - I decided our Disney Side party would be equally fun, but realistic for working moms, smaller budgets and those on a time crunch. My guests would be the kids in my family & all my friends on Twitter, my budget would be $20, I would have 2 hours to set-up AND I would run a race in the middle of it all. This is real life. I am mom who travels, works, writes, runs races and navigates through life with little cash and even less time. What I do have an abundance of is Disney spirit. And that's what our Disney Side party was all about! I woke up early Saturday morning to bake & decorate cupcakes. I set-up the party table by utilizing all the party decorations and products provided to me by Disney and our sponsors. We received fantastic photo packs from HP, Craisins from Ocean Spray, beautiful artwork, runDisney cheer cards & bracelets, tattoos, stickers and Hallmark party decorations. 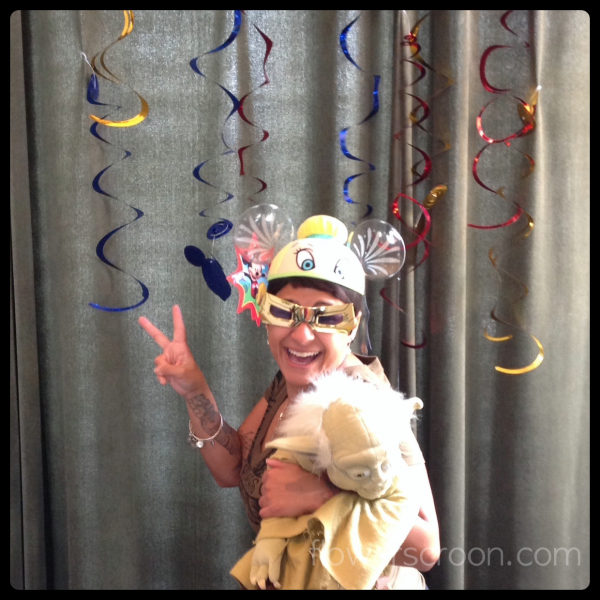 Then, I put together the goodie bags and set-up our photo booth. Once the house was ready, I left. I had budgeted just enough time to drive to San Jose to pick-up my 408K race bib & check-out the expo before our first guests would arrive. Ryan Gosling? Yes, I like. When I returned home, I greeted our guests and alerted my Twitter friends to play along to win prizes from our great sponsors. Once my first guest put on a Disney Side costume from the photo booth, I decided it was time to give away our first prize. Congrats to @sunnymorton @ndeckerrunner @orlandotiki @BamagirlRUNS @essayareayaitch & @KristyRunsKato - all winners of an #HPPhoto pack! One of our first group activities (besides devouring delicious cupcakes) was playing a Disney Side Bingo game. The kids really loved it! The Bingo categories were based on fun Disney attractions, characters and resorts. Some were familiar to the kids and some were new. This was a neat opportunity for them to share their own Disney knowledge with each other. It was really fun to watch them play and tell stories. I used this as an opportunity to give my Twitter friends a shot at another prize. This time the prize was 2 of the very sweet Mickey & Minnie prints everyone had asked about. The contest? Correctly guess who won the first round of Bingo. Many people guessed, but only 2 were correct! Play the Instagram video below to hear from the winner. Congrats again to @sunnymorton @ndeckerrunner - both winners of the Mickey & Minnie print! 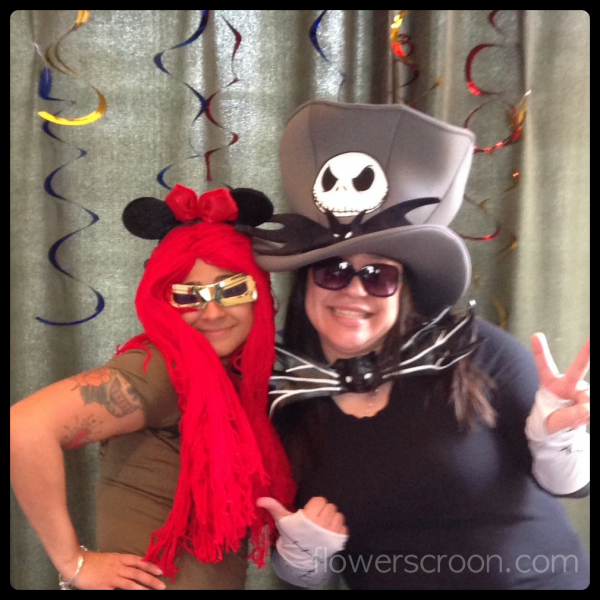 Another huge hit at our party was the photo booth. Filled with runDisney medals, wigs, ear hats, costumes, hats and sunglasses - the photo booth let everyone show ALL their Disney Sides! Check out the slideshow below for a peek at all the fun! Since the kids were staying the night, I made sure to feed them a healthy, satisfying dinner before we settled in to watch a marathon of Disney movies. We had spaghetti (prepared with my popular homemade spaghetti sauce) and a cool, fresh salad. We stayed up all night watching movies, and before I knew it - it was time for me to drive back to San Jose to run the 408K Race to the Row. Once the race was over, I hopped in my car and made it home in time to enjoy breakfast and more games. The kids were really excited to play with my medal. All of the kids went home with a goodie bag filled with items that were in my hostess kit (stickers, tattoos and Ocean Spray Craisins) as well as items I picked-up for the kids at discount stores. The parents left with HP Photo packs and the lovely Mickey & Minnie artwork. I later printed the photo booth pictures and mailed them out to the kids and their parents, thanking them for coming to my party. 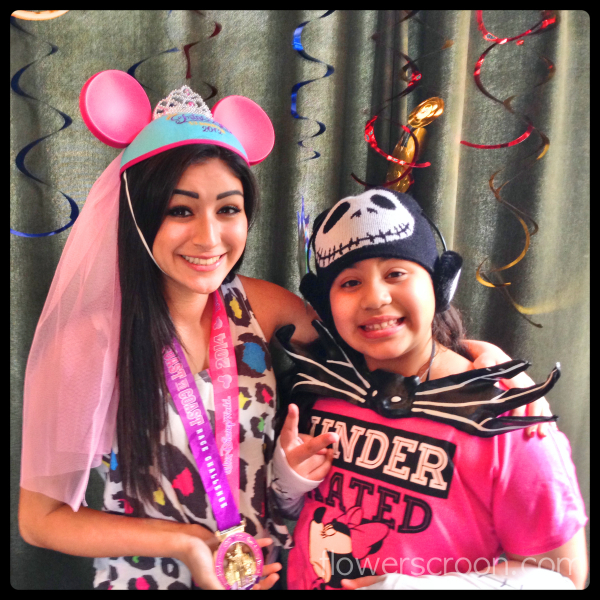 Our fabulous Disney Side Celebration was proof that any family on a budget can take time from their busy lives to celebrate their Disney Side in a big, fun way. The only items I spent money on were the extra gifts & snacks I picked-up from discount shops for the kids' goodie bags, the decorations for the cupcakes and the Oreos I used for the Mickey shaped cookies. Everything else came from my pantry, refrigerator and closet. Remember, creativity is free and so is your Disney Side. Visit these sites for more ideas: spoonful.com, Disney Side, disneysidecelebrations.com. I can't wait to hear about your Disney Side Celebrations! Car Cache, my purse's new BFF!